Oiled jacket. Khaki brown, zipped front. Drawstring hood. Five snap fasteners down front. Two side pockets with snap fasteners. Blue lining. Belt with metal buckle. Flap on hood with metal tying buckle. Cuffs with three studs. From neck 73 (l) x 58 ( w)cms. Sleeve 49(l) cms. Inside back label reads "HONORBILT (REGD) SIZE 2 WATERPROOF PROTECTIVE SUIT LAWRENCE NEDAS & CO 1945". This lovely old jacket was given to Mick Tighe by Mary Connor, widow of Ephraim Connor, who for many years owned Glenspean Lodge Hotel in Inverness shire. Amongst other things, Ephraim was a homeopath and was in the process of patenting a homeopathic remedy for 'worming' dogs when he died in the early 1970's. 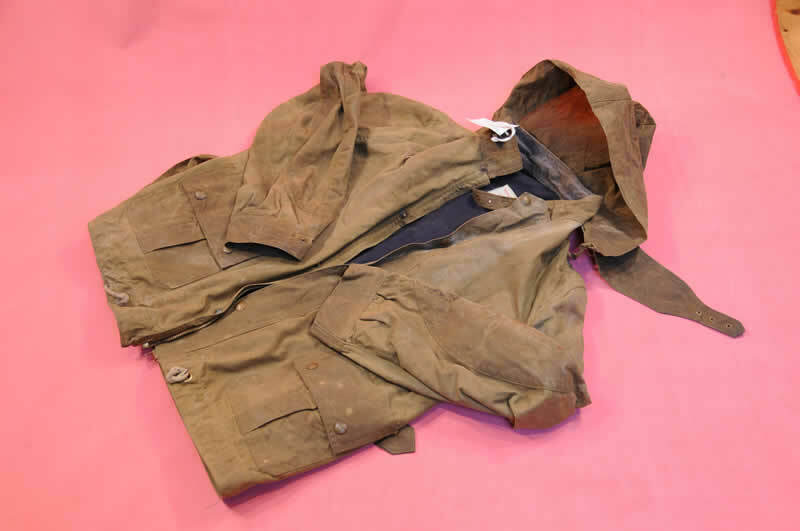 He was very much of the 'hunting,fishing,shooting brigade' which was probably why he acquired this jacket, though he does seem to have been in the Terratorial Army at the end of WWII, so could have been issued with it. The waterproof waxed cotton suits produced by, amongst others, Lawrence Nedas Ltd of Essex, were commissioned in 1943 by the Royal Navy, and manufactured from 1944-45. The design was based on pre-war one-piece waxed cotton motorcycle suits, now cut into two separate garments. Although contemporary photographs illustrate that some suits were issued and worn by the wartime Royal Navy, it would seem that by the late 1940s large stocks of unissued and unused suits had been allocated for dispersal through army surplus stores. It was through these outlets that the practicality and affordability of the suits found favour with outdoors adventurers and with, in particular, motorcyclists who admired the suit's durability and resilience. By 1950 the garment had evolved, together with other war surplus clothing such as tank suits and despatch rider coats, as one of the preferred garments worn by the trials bike riders of the ISDT (International Six Day Trials). The waxed cotton motorcycle clothing manufacturers Barbour, and later Belstaff, recognised the practicality of the garment and from the early 1950s began to manufacture their own specifically-designed and retailed versions of the suit, marketed as the International and the Trialmaster respectively, both of which have remained in continuous production as a staple of motorcyclists1 clothing to this day, over 60 years after the date of original design.